This is more a health post than a recipe post, but it involves items we all have in our kitchens, and besides - I need to save this someplace! Honey is the only food on the planet that will not spoil or rot. What it will do is what some call 'turning to sugar'. In reality, honey is always honey. However, when left in a cool dark place for a long time it will "crystallize". When this happens loosen the lid, boil some water and sit the honey container in the hot water, but turn off the heat and let it liquefy naturally. It is then as good as it ever was. Never boil honey or put it in a microwave. This will kill the enzymes in the honey. HEART DISEASES: Make a paste of honey and cinnamon powder, apply it on bread instead of jelly and jam and eat it regularly for breakfast. It reduces the cholesterol in the arteries and saves the patient from heart attack. Also, those who have already had an attack, when they do this process daily, they are kept miles away from the next attack. Regular use of the above process relieves loss of breath and strengthens the heart beat. In America and Canada, various nursing homes have treated patients successfully and have found that as one ages the arteries and veins lose their flexibility and get clogged; honey and cinnamon revitalize the arteries and the veins. ARTHRITIS: Arthritis patients may take daily (morning and night) one cup of hot water with two tablespoons of honey and one small teaspoon of cinnamon powder. When taken regularly even chronic arthritis can be cured. In a recent research conducted at the Copenhagen University, it was found that when the doctors treated their patients with a mixture of one tablespoon Honey and half teaspoon Cinnamon powder before breakfast, they found that within a week (out of the 200 people so treated) practically 73 patients were totally relieved of pain -- and within a month, most all the patients who could not walk or move around because of arthritis now started walking without pain. CHOLESTEROL: Two tablespoons of honey and three teaspoons of Cinnamon Powder mixed in 16 ounces of tea water given to a cholesterol patient was found to reduce the level of cholesterol in the blood by 10 percent within two hours. As mentioned for arthritic patients, when taken three times a day, any chronic cholesterol is cured. According to information received in the said Journal, pure honey taken with food daily relieves complaints of cholesterol. 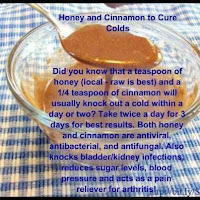 COLDS: Those suffering from common or severe colds should take one tablespoon lukewarm honey with 1/4 spoon cinnamon powder daily for three days. This process will cure most chronic cough, cold, and, clear the sinuses. 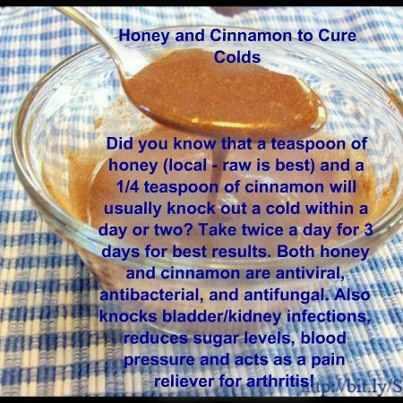 UPSET STOMACH: Honey taken with cinnamon powder cures stomach ache and also clears stomach ulcers from its root. INFLUENZA: A scientist in Spain has proved that honey contains a natural 'Ingredient' which kills the influenza germs and saves the patient from flu. You might want to share this information with a friend, kinfolks and loved ones. Everyone needs healthy help information ~ what they do with it is up to them. You may also want to share this with your email buddies... They deserve to be healthy too! I think it's time for some cinnamon and honey. I do not want to get this cold!